Facelli Winery: The first winery, and quite frankly the friendliest one we visited all day. Tucked against the Sammamish River Slough and the Burke Gilman Trail, do not be fooled by the industrial street curb facade. A mix of red varietals was offered, with consensus winners being the 2004 Columbia Valley Syrah and the 2005 Columbia Valley Barbera. The 2005 Late Harvest Riesling was also a hit. Look for specific reviews related to these wines in months to come. Winemaker Lou Facelli and family were endearing, offering a quaint, comfortable space to enjoy tasting bliss. Lou and wife, Sandy, captivated our minds and ears with stories of varietal struggle and success. Special thanks to Sandy for taking the time to explain the Facelli Winery philosophy to us all, and for making the Facelli Winery a truly personal experience. Woodhouse Family Cellars: Situated in a similar industrial setting to that of the Facelli Winery, Woodhouse Family Cellars has taken obvious strides to increase curb appeal. A walkway entrance consisting of a vegetative oasis, among an array of wine barrels and wooded trellis leads one to the front door. Once inside the winery, I was caught off guard by an abundance of women, although later realizing a bridal shower was occurring in an adjacent commercial sized kitchen area. We were told the winery was playing host to a wedding that night. Modern furniture selections, in addition to stainless steel appliances at both the tasting bar and adjacent kitchen area, gave way to a chic and stylish atmosphere. A raised roof, which many of us believed created a warehouse type feel, erred of a less than personal touch. Hoping the tasting associates would raise the bar, I was equally unimpressed with their lack of customer service. Tasting offered a collection of varietals on the Kennedy Shah Label. Highlights selected among the group included Auntie Meredith’s Picnic Blend, a composition of 50% Chardonnay, 25% Viognier, and 25% Chenin Blanc. A second wine, most appreciated by Culinary Specialist Chris Heuchert, was the Orange Muscat. Overall, I was left apathetic with the overall setting and wine offerings provided by Woodhouse Family Cellars. I felt no unique attachment to any particular wine, and was eagerly prepared for the next offering on our journey, Silver Lake Winery. Silver Lake Winery: Perhaps you’ve seen Silver Lake wines in your local grocery store. Reasonably priced, with ample selection to choose from, I’m frequently tempted. Once at the winery my palate was officially halted, having to choose from a variety of labels, offering a mixture of varietals. 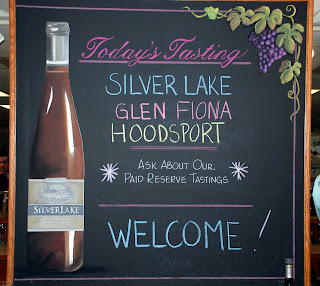 I learned that Silver Lake Winery has teamed with Glen Fiona Wines, Hoodsport Winery, and a jazzier label dubbed Blind Date. Being the responsible drinker, and designated driver, I opted for one label, selecting the Hoodsport brand. The town of Hoodsport was a traditional vacation spot for my family while growing up. I first had a 2005 Merlot, which offered an awesome bouquet of berries, cherries and spice. The tasting associate praised the wine, stating it had gained recent notoriety in a wine publication, which lauded, “American’s will drink the HELL out of this wine!” I was impressed, not so much by the use of a curse word in a wine publication, but by the actual wine itself. My second selection was a stretch, hoping to find a wine my wife would enjoy. She has an affinity for wines with named fruits in the label, i.e. “Strawberry Mist”, “Melon Medley” etc. I selected a Hoodsport Pear Wine. I was unmoved, and the wine found itself emptied into the spittoon. The most affordable winery we visited all day; Josh, Drew and Chris all took a liking to the mixture of Syrah’s offered by Silver Lake and Glen Fiona. It appeared the Glen Fiona winery came out on top, having made several sales to our particular group. Januik / Novelty Hill Winery: Technically two wineries located in one building, anyone who’s driven on Woodinville/Redmond Road has awed at the unique architectural existence that’s observed. Unsure what to expect inside, I was left simply speechless at the beauty and ambiance that’s bestowed. A little research led me to the responsible party for such wonderful architecture and design; a company called Mithun. A link to a press release on the winery website gives the architecture and design more justice than I can do on paper. A link to the Seattle Post Intelligencer offers an editorialized perspective. Januik/Novelty Hill has created a space that exerts feelings of familiarity and relaxation. The setting provided an overwhelming sense of intimacy with wines I had yet to even taste. Tasting offered a 3-tiered approach, priced at $5.00, $10.00, and $15.00. I chose the $15.00 Single Vineyard flight and was blown away by the Cabernet Sauvignon’s offered by both Januik and Novelty Hill labels, true winners in my book. The Syrah’s were a close second. While the most crowded winery we visited during the day, a friendly, knowledgeable staff capped off what had become quite an enjoyable wino experience. Januik/Novelty Hill Winery shines, exerting a contemporary feel, capped with magnificent wines to boot. I look forward to my return. In Conclusion: Despite transplanting from Pinot Noir country for the day, it became evident that our mere thumbprint on Woodinville Wine Country created a lasting, positive impression for my friends. Although yes, I was somewhat embarrassed by their persistent requests to avoid sales tax, sharing my backyard locale was a treat. I did learn one thing on this journey. When asked where they were from, I couldn't help but laugh, hearing my friends utter, “The Willamette Valley”. I had always placed them in Corvallis, which to their credit is in the Willamette Valley. I saw it as being no different than me uttering “Western Washington” or “Puget Sound”, except for the fact that the Willamette Valley is renowned for having some of the greatest wine in the world. I considered that if in another social setting, i.e. fly-fishing or theatre, would my friends still originate from the “Willamette Valley”, or candidly be a few hours from the Rogue River, or, just up the road from Ashland. I decided their logic was correct. When I’m visiting Oregon Wineries, I will proudly exclaim “WOODINVILLE” as my hometown …despite living in nearby Bothell. Paul, thanks for sharing your experiences, both the good and the bad, after visiting wineries in Woodinville. It's great you and others at The Oregon Wine Blog are covering winery visits, as this is far too often overlooked amongst many wine bloggers. Keep up the good work connecting us to the people and places behind Washington and Oregon wine.